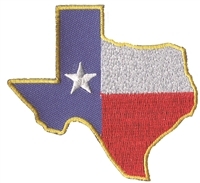 3154 - Texas flag souvenir or uniform embroidered patch. 100% embroidered. 2" tall x 3.25" wide. Patches sew or iron-on and are carded to hang on a display rack for stores. 3155 - TEXAS medium flag shield embroidered patch. 2.5" tall x 2.75" wide - Patches sew or iron-on & are carded to hang on a display rack for stores. 3162 - TEXAS flag metallic gold shield embroidered patch. 3.25" tall x 2 13/16" wide - Patches sew or iron-on & are carded for retail rack display for stores. 3153 - TEXAS souvenir shield embroidered patch. 3 1/16" tall x 2 9/16" wide - Patches sew on & are carded for retail rack display for stores. 3157 - TEXAS state shape embroidered souvenir patch. 3" tall x 3.125" wide. Patches sew or iron-on & are carded for a display rack for stores.